CHICK MAGIC AG ORGANIC FERTILIZER is great for any crop. The ingredients are all organic with slowly available nitrogen that resists leaching. The primary nutrients (N-P-K) are naturally balanced to provide vigorous growth while producing abundant vegetables, fruits, flowers, lawns, trees and shrubs. CHICK MAGIC AG ORGANIC FERTILIZER also contains abundant calcium which plays more roles in the health of both plants and soils than any other nutrient. All nutrients are derived from processed chicken manure which does not contain any weed seeds, bedding, fillers or any harmful pathogens. This product meets USDA National Organic Program requirements for organic crop production. Long-term USDA-ARS studies show that natural organic practices significantly build organic matter and increase microbial populations in the soil which improves soil structure, aeration, and moisture holding capacity. Chick Magic Ag Organic Fertilizer is derived from pure laying hen manure. Our hens are fed a high quality diet rich in vitamins and minerals leaving numerous primary and secondary nutrients present in our product. Chick Magic helps to make healthy soil which leads to healthy crops and higher yield. Experience the real value for yourself and try Chick Magic! What is CHICK MAGIC AG ORGANIC FERTILIZER? 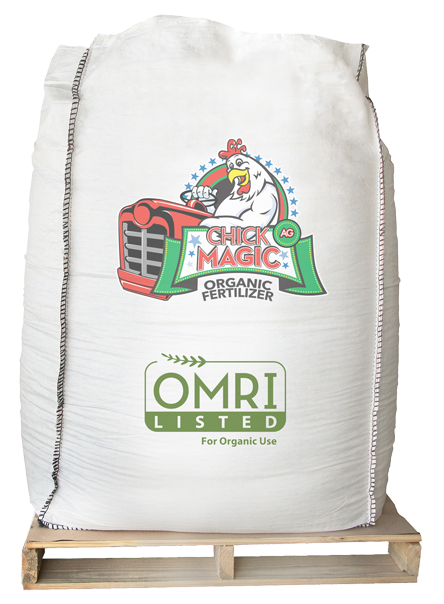 CHICK MAGIC AG ORGANIC FERTILIZER is a high quality, OMRI listed fertilizer derived from pure, processed poultry manure. The process begins with the manure being belted away daily providing base material without litter, bedding or fillers. After preparation, the manure is taken through a heat tunnel lowering the moisture to 10-12%, killing the weed seed and any pathogens of concern. 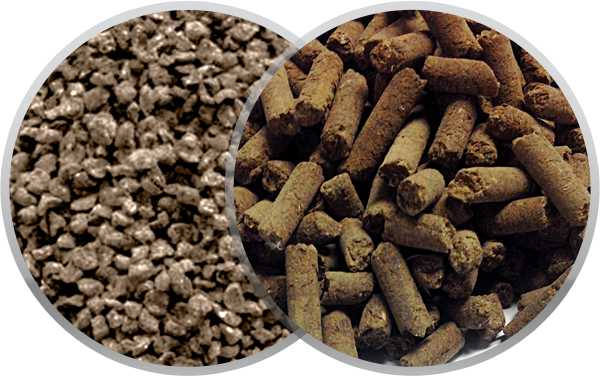 The final step is the pelleting process creating a product that is easy to transport and apply. 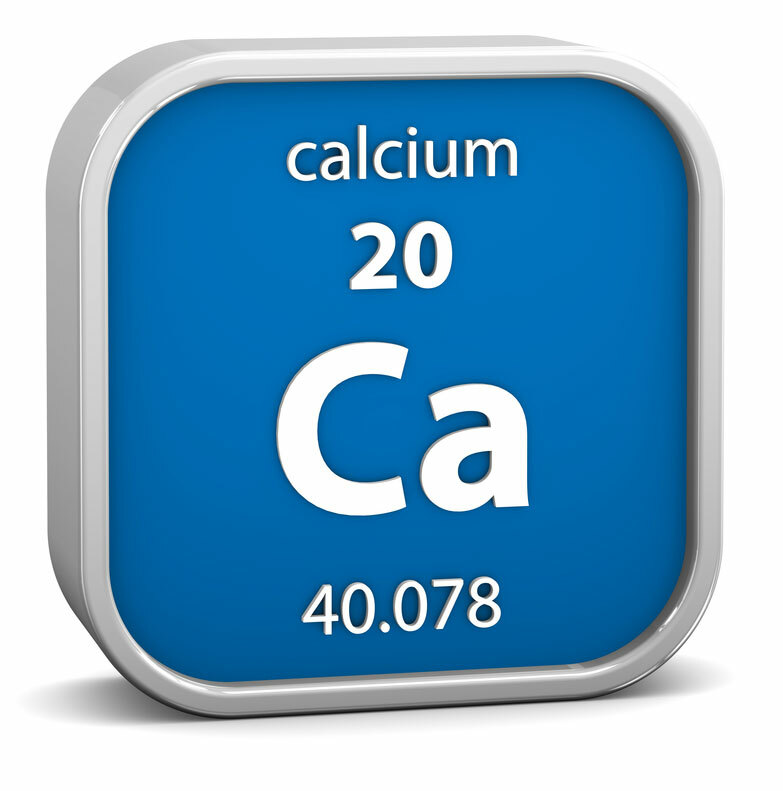 What is the significance of the high calcium? Calcium is a great healer and plant antibiotic. It improves root and leaf growth, builds cells and increases overall plant health. Calcium is often called the “King of Minerals” because of its dominant role in both the soil and plant. In soils, it helps balance pH which ultimately facilitates nutrient availability. In plants, it promotes rapid root establishment and strong cell formation. Calcium plays more roles in the health of both plants and soils than any other nutrient. Our product has a guaranteed 9% Ca. Is there an offensive odor when using CHICK MAGIC AG ORGANIC FERTILIZER? CHICK MAGIC AG ORGANIC FERTILIZER has been processed and pasteurized to reduce any offensive odor. The product breaks down quickly when it is wet and once tilled into the soil, any remaining odor quickly dissipates. Will CHICK MAGIC AG ORGANIC FERTILIZER burn my plants or trees? CHICK MAGIC AG ORGANIC FERTILIZER is a naturally non-burning fertilizer due to its organic composition. Containing both water soluble and water insoluble nitrogen allows CHICK MAGIC AG ORGANIC FERTILIZER to be applied with the seed at planting or when doing transplants. What makes CHICK MAGIC AG ORGANIC FERTILIZER different from other fertilizers being used for organic or sustainable farming? Chicken manure has been recognized as a valuable agricultural input for thousands of years. It not only has the NPK, but also a large variety of important trace elements and minerals (Boron, Iron, Manganese, Copper, and Zinc). The combination of the high-quality diet we feed our hens and our proprietary process serve to improve upon an already excellent natural fertilizer. Calcium is often called the “King of Minerals” because of its dominant role in both the soil and plant. In soils, it helps balance pH which ultimately facilitates nutrient availability. In plants, it promotes rapid root establishment and strong cell formation. Calcium plays more roles in the health of both plants and soils than any other nutrient. CHICK MAGIC AG contains a guaranteed analysis of 5-3-2 + 9% Ca.